Although I think it’s possible to survive most types of disasters while living in the city, that doesn’t mean the city isn’t more dangerous than the countryside. By choosing to remain in the city, you are facing several potential dangers, and it’s important that you be aware of those dangers. 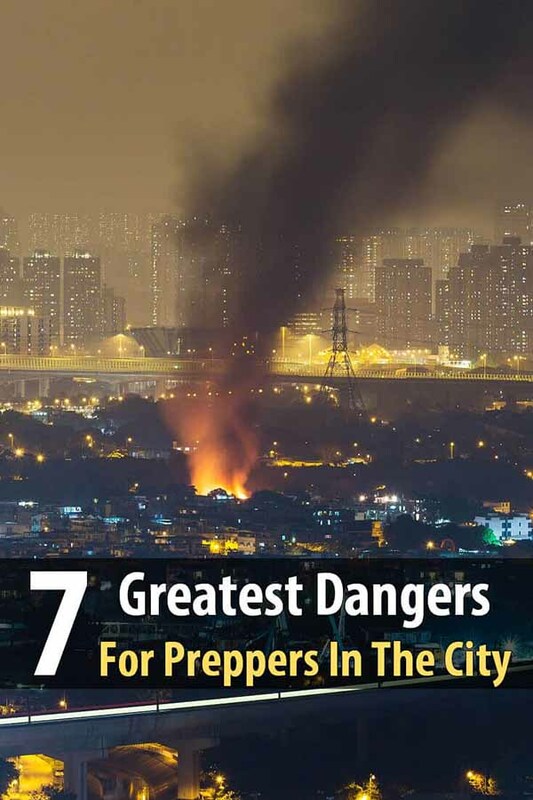 In this article I’ll cover the 7 greatest dangers for preppers in the city. One of the biggest drawbacks to hunkering down in a city is the lack of resources and space. Big cities are not typically self-sustainable, and instead have many lifelines of food and supplies shipped in from a multitude of locations. The natural way to combat a food shortage is to already have a stockpile available. If you have the space to do so, stock up on several months of an emergency. And if you don’t have the space, then make space. You should also have an escape route planned and a bug out location to go to. In a disaster scenario, the chances that a city’s natural gas employees are all keeping their regular work hours is low. While they may be able to lock down immediate threats, they might not be able to prevent disaster forever. A natural gas infrastructure left without maintenance for months at a time poses a danger to everyone dwelling in the city. You must prepare for a scenario where you will be threatened by leaking natural gas, and to do that you should purchase a gas mask or make your own. It is also best to relocate your shelter as far away from a natural gas main as possible. Very few people consider the money and effort it takes the local government to orchestrate the removal of your trash. In a survival scenario, the garbage truck won’t come every week like it always has. As a result, the buildup of trash will pose a very real threat to any prepper wanting to stay clean. Similarly, survivors living in proximity to one another without electricity and trash removal are much more likely to contract and spread disease, and nothing could be more harmful to a tightly-packed population than an epidemic. Be mindful of ways to dispose of your trash. Recycle and reuse as many inorganic materials as you can. Come up with a system to mulch all your food waste as well. This will go a long way towards keeping your environment clean, and it can serve as a great fertilizer for a garden. Water is perhaps the most important part of survival. In a city, clean drinking water is created and maintained by city sanitation engineers who have the facilities and know-how to purify millions of gallons of water. In the event of a natural disaster, all this may cease, leaving you with few options for clean drinking water. Know how to purify water on your own and have the available materials at hand. Boiling water, using iodine tablets, and having access to a water purifier are all great options. Running water goes beyond drinking, though. Without running water, the entire sewage system collapses, leaving you without a way to dispose your waste effectively. Sewage sanitation will have to be in the forefront of your mind as you develop ways to dispose of your waste without harming yourself or others close by. If you don’t come up with effective means to do this, unsanitary conditions will lead to disease and disaster. In the event of a disaster, law enforcement officials will most likely instate martial law. While this is meant to protect citizens, often it can rob them of the means to protect themselves. History supports this idea, with many examples of government agents confiscating registered firearms from law-abiding citizens in the wake of a natural disaster. Countering this threat is simple: arm yourself in multiple ways. Typically, law enforcement officials are the good guys and can be a great help in a dangerous situation. If they become a threat by taking firearms, have backup systems of protection in place. Having a gun is not your only means of defending yourself, and resisting the National Guard while they are trying to take your guns will probably lead to an unsafe situation for you. The threat of people impersonating law enforcement officials is also very real. Criminals thrive on chaos, and some may try to take advantage of the natural trust people give police, firefighters, and other men and women in uniform. While it can be tough to distinguish a real law enforcement agent from a fraud, keep your eyes open for any mannerisms or actions that seem out of place. Probably the most prevalent threat in a city is other people. If you can master having clean food, clean water, shelter, and sanitary living conditions, there will probably be someone else out there who wants that and is willing to resort to violence to take it. The best way to handle hostile groups of people is to belong to a community of your own that protects itself. People survive better together, and having someone you can trust may make all the difference. The problem with fleeing the city is you may not be the only one with that idea. In the initial moments of a disaster, people’s primal fight for survival oftentimes overrides their compassion and rational thinking. Examples of this can be seen in rushing cars creating traffic accidents and people trampling each other to death in an effort to escape disaster. If you don’t bug out quickly enough and hordes of people are already trying to leave using cramped, small venues and exits, you might be better off waiting until the madness dies down. The threat of being without power, water or food is real. Sadly, many Americans are not prepared for even the smallest emergency such as a temporary power outage. I wish there was more awareness for emergency preparedness in our country. Food and water storage and a back up solar generator are the most important supplies that everyone should have for the unexpected. Gas ‘leaks’ also come in the form of unattended stoves/heaters, etc. Assuming that natural gas lines remain pressurized versus being completely shut down, there could be many open valves inside apartment buildings or vacated businesses. The risk of natural gas explosions should be a major concern. There are 3.9 million metro residents and nearly 4.9 million registered (private, commercial and government) vehicles. If everyone tried to evacuate at the same time, you would have approximately 28,000 miles of vehicles attempting to access six possible routes away from the city. I exclude semi-tractor trailer rigs, which would add tot he overall length of traffic. If evenly distributed, that would place more than 810,000 vehicles on each route. At a constant 30 miles per hour, it would take more than three days for the last vehicle to clear any point on any route that you chose to measure. And that assumes, of course, that no vehicle ran out of gas or had any form of mechanical breakdown during these three days. Do the math for where you live. My point is that if you live in a large metro area with limited evacuation routes, you are screwed. Don’t expect people from rural areas to be coming to your rescue.